This 3D printing stock is the best pure play to buy now, as it doesn't face the significant challenges that the large players currently do. The two-year-plus period since 2014 has been pure carnage in the 3D printing space, with the stocks of the two largest companies, Stratasys (NASDAQ:SSYS) and 3D Systems (NYSE:DDD), losing 86% and 93% of their value, respectively. Stratasys remains the better of the two large players, in my opinion, though 3D Systems has the chance to reinvent itself once a new CEO comes on board. That said, new 3D printing investors should ignore Stratasys for now, even though its beaten-down stock price might look tempting, as it has huge challenges ahead. There's a better pure-play 3D printing stock to invest in: Swedish industrial metals specialist Arcam (NASDAQOTH:AMAVF). Arcam's stock has performed considerably better than the other pure plays over the one-year period through Jan. 15. Data source: YCharts. Since the start of 2015, Stratasys, along with 3D Systems, has reported a broad-based decrease in capital spending for 3D printers among industrial customers. Stratasys' management has attributed this major slowdown to overcapacity in the field because of the large number of 3D printers purchased during the previous few years. There's no reason yet to believe this significant macroeconomic headwind is over. Additionally, Stratasys' desktop unit, MakerBot, is likely to continue to negatively affect the company's overall results. Arcam's business has been performing well and the company doesn't have any known significant challenges on the near-term horizon. Notably, it's the only pure-play 3D printing company that's profitable on a trailing-12-month basis. Arcam's EBM systems are used to 3D-print orthopedic implants. Image source: Arcam. Arcam makes 3D printers that use its proprietary electron beam melting (EBM) technology to produce metal components. It sells its printers to customers in the medical implant and aerospace industries. Additionally, it acquired two companies in 2014 that have enabled it to become vertically integrated. Canada-based metal powder producer AP&C guarantees that Arcam will have a readily available supply of high-quality titanium powder to provide to its customers buying EBM systems. It also allows Arcam to profit from the industrywide growth of metal 3D printing, as it also sells powders to other companies. Connecticut-based DiSanto, an orthopedic-implant contract manufacturer, should help Arcam expand the market for its 3D printers. The more business DiSanto generates, the more printers it will need to acquire from its parent company. 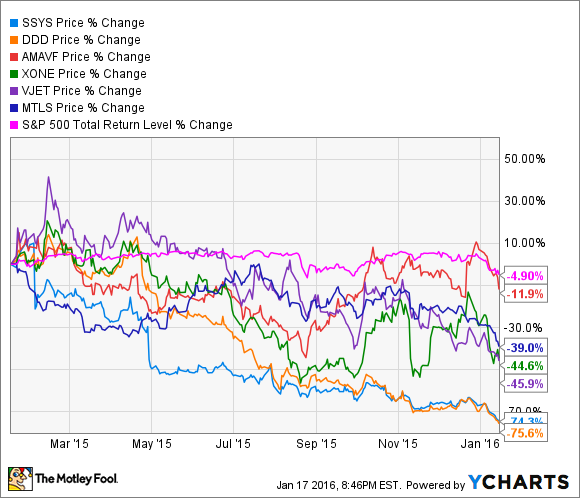 There are several reasons that Arcam is currently a better stock than Stratasys and the others in the group. First, its management has been executing better than that of the other pure plays. Stratasys' management was largely at fault for the MakerBot blowup by releasing the fifth-generation Replicator while it still had considerable bugs. 3D Systems experienced several recent notable product quality issues, indicating quality-control and possibly other issues. ExOne's management has failed to come close to achieving its own revenue goals in every period since it went public in 2013. Second, Arcam's technology is entirely proprietary, so any entity that wants a 3D printer that uses EBM technology has to buy it from Arcam. This makes Arcam less vulnerable to competition. Meanwhile, one of Stratasys' core technologies, fused deposition modeling (FDM), lost key patent protection in 2014. Arcam's Q20 is geared toward series production of metal aerospace components. Image source: Arcam. Third, Arcam's sole focus on metal 3D printing benefits it in several ways. It gives Arcam the most growth potential, because metal 3D printing is the fastest-growing space within the 3D printing industry. It helps insulate the company from the overcapacity issues in the polymer 3D printing space that continue to plague Stratasys and 3D Systems. Finally, it helps insulate Arcam from competition from HP and start-up Carbon3D, both of which plan to release super-fast polymer 3D printers for the enterprise market this year. Lastly, Arcam's two acquisitions reflect a focused and synergistic approach to acquisitions. Stratasys' purchase of MakerBot, on the other hand, continues to look like a poor move. MakerBot, focused on the consumer and education markets, has little to no synergy with Stratasys' core enterprise business. Along with notable positives, Arcam also has considerable risks. First, there's a business concentration risk. If Arcam's EBM falls out of favor with industrial customers, it has has no other technologies to help pick up the slack. Second, there's a stock-price volatility risk. Arcam's stock is listed on the Nasdaq OMX Stockholm, though it can also be bought over the counter in the United States. In part because of its foreign listing, Arcam is very thinly traded, which increases its volatility. Third, there's a currency risk for investors who buy Arcam's stock over the counter in the U.S., since the company is based in Sweden. The Swedish krona, like the euro and most other currencies, has lost considerable ground to the U.S. dollar since 2014. In fact, the krona has lost a whopping 33% of its value versus the U.S. dollar since 2014 -- even more than the euro's 27% loss. Stratasys remains the better of the two large, diversified 3D printing companies. However, it has considerable challenges on the near-term horizon, so investors should resist the urge to snap up what they might consider "cheap" shares. The better 3D printing stock for risk-tolerant investors to buy at this time is Arcam, as its business is performing well.